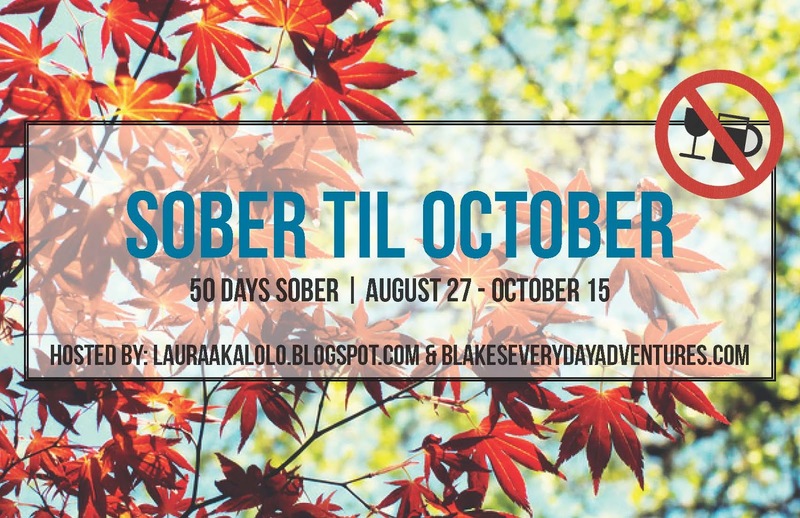 I wanted to do an update on how everything is going with my personal goals as well as my 50 DAY, Sober 'till October challenge with my partner Blake. It's day 16, in case anyone else is keeping track. Yeah, only SIXTEEN. Crap this is going to be a long, tough challenge! There was something last week that solidified my determination to stick with this challenge. Last week my friends and I wanted to plan a girls night for Saturday night, because one of our friends was in town. They all jumped on the idea of tailgating at the college football game (BSU, yeah the one with blue turf). I immediately expressed my concerns with that idea, mostly the people, chaos and lack of parking that is included in going down to the game. I did mention that part of the reason I didn't want to go was that I wasn't drinking. Another one of my friends was on my side and agreed. She is also doing a special low carb diet and is cutting back the alcohol. That's when we got a response in the group message. Someone pointed out that it wasn't fair that our diet restrictions were affecting our plans. I get where she is coming from, especially since she was the friend coming to visit. But really? I wanted to respond with something nasty like WELL WHY DO ALL OUR PLANS REVOLVE AROUND DRINKING?!! Because they do. At my age, and in my group of friends, most of the time we spend together revolves around drinking--whether it be at a barbeque, tailgate, happy hour, down town, bowling... Sure all those things can happen without alcohol, but when we plan it, it is assumed that alcohol is involved. We need to change our views and habits. Or at least I do. My life, or at least my weekends, should not revolve around drinking. Period. While I obliged and said I would still go to the tailgate if she REALLY wanted to go, I suggested we do something before the tailgate so I could see them all and even be DD for them and drive them down so they wouldn't have to worry about parking. Luckily that worked. We went out to dinner (at a brew pub, which was really tough for me) and then I drove them down to the tailgate. Everyone was happy. I realize the rest of the challenge is going to be that same way. A compromise. Sure I can avoid the drinking scene altogether. Or I can go out with my friends and just not drink. But I think a majority of the time, for my sanity, I will have to be somewhere in the middle. It's not going to be easy. I want to stick with this to prove to myself I can. Prove that I'm not a quitter, that I have will power, and that weekends with friends can be just that, without the alcohol. Do all your social situations revolve around alcohol? Do you have suggestions for fun ways to deviate from that with my group of girl friends? I'd love to hear your take! A lot of the things I'm invited to involve drinking. 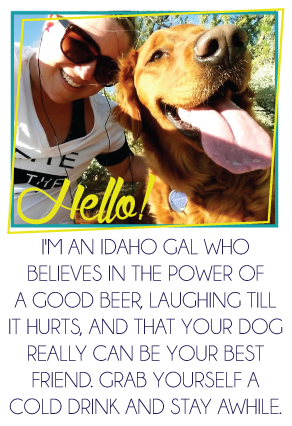 It's hard not to drink when everyone else is enjoying a beer -- especially when it's at your favorite brewery! Ugh. And it's ONLY day 16?! Yikes. We can do it! Pretty much all of my social activities involve drinking. Sometimes I will try to at least have a fun looking non-alcoholic drink to make myself feel less deprived. I usually just avoid going out when I'm not drinking which I know is not all that helpful. Lol, I have zero will power! It's not fun to say but if your idea of hanging out with your friends is no longer partying but theirs is then you'll probably be seeing less of each other. You should work to invite them to things you want to do and have that option open to them but if they don't want to go hiking or to the farmers market then that's their loss. People change and grow and maybe it's time to make new friends with the same interests you have now. Nothing against your current ones (still be their friend) but you have to surround yourself with like minded people and if they have the same interests/goals that you do it helps you achieve yours. All your friends drink because that's what you used to enjoy doing in every social situation (just taking from reading your blog) now - that's not a big deal but you can expect them to change just because they do. I gave up carbs and while I yell at everyone that eats them in front of me I don't expect anyone to do what I'm doing. It is much easier to bond with my friends that are health conscious like me though and I find myself hanging around them more. Most people also don't party forever so your friends will come around. You just have keep to your guns and not do anything you're not comfortable with. Congrats on 16 days! Just think you're only 9 away from HALFWAY. You can do it. focus on the countdown - only 34 left!